Sometimes you come across wonderful WMV videos and want the remarkable audio but no video. You might want to extract the episode or the audio of a WMV movie for playback on your iPod, as ringtones for iPhone, or to create your own masterpiece. The question is: how to convert WMV to MP3 or extract MP3 from WMV files? Actually, it's just a piece of cake. You only need a program - WMV to MP3 converter. Just check below the Wondershare WMV to MP3 video converter and online WMV to MP3 video converter. Convert WMV to 1000+ formats, like MP3, AVI, MKV, MOV, MP4, etc. 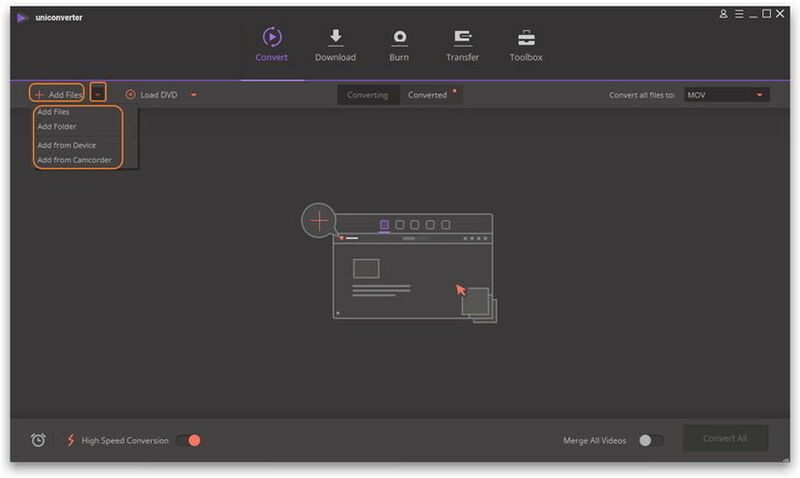 Edit videos by trimming, cropping, adding effects, or merging video clips. Download or record videos from video sharing sites like YouTube, Facebook, etc. Click the Add Files button at the top-left corner, choose to add video files or video folder, or choose to add from device. Directly drag and drop your wanted files to the primary interface. Under the Target section, click the drop-down icon to expand the output format list. 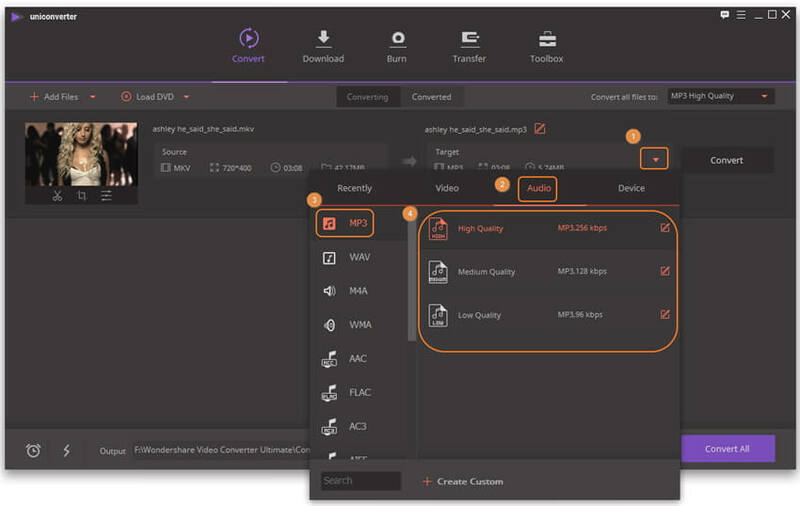 Select Audio > MP3 and choose your desired audio quality. Tips: WMV to MP3 Video Converter also provides powerful editing functions. Click the editing icons below the imported video thumbnail, you can set the part of the WMV file you want to extract the audio as MP3. For more details, please check How to edit video. Click the Convert button to start converting WMV to MP3. Then you can click the folder-like icon in the bottom to find out where you save your MP3 files. Note: You can also set the location to save your converted files by clicking beside Output. 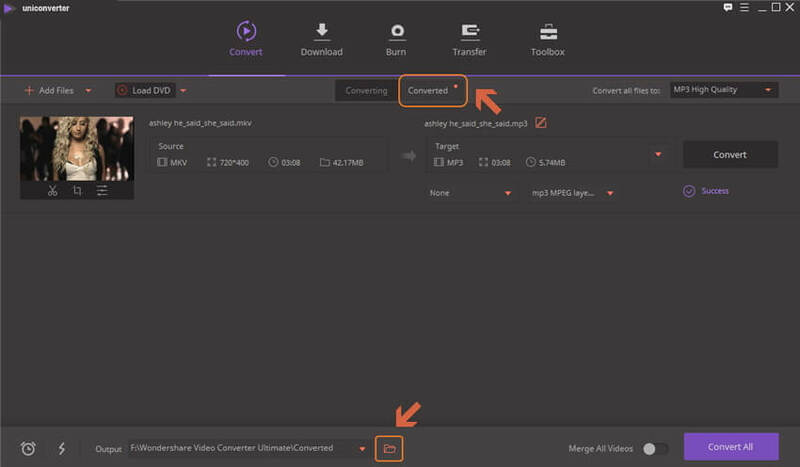 Convertfiles.com is an online tool for file conversion that enables you to convert your file from WMV to MP3 with the utmost convenience and ease. You have the option of sending it to your mail for downloading it immediately for use. A great audio extractor: You can use this free online WMV to MP3 converter to extract the audio from your favourite movies. You can not only convet WMV to MP3, but also to WMA, OGG, AAC, M4A, and more. Fast video downloader: Just copy the online video link, and then this free and online WMV to MP3 converter will soon help you download videos. Below are the simple steps for your guidance. Step 1 Click Browse to upload the VOB file that you wish to convert. Step 2 Click the drop-down icon beside Output format and select AVI as the target file format. Step 3 Click Convert and a link for downloading the conveted file will appear in no time. 1. I have a WMV file, how to play it on my iPod? iPod, like all the other Apple devices, only supports audio formats like MP3, AAC, and video formats like MP4, MOV and M4V. To play WMV on your iPod, you can just use a video converter to convert WMV to the iPod suported formats. 2. M4A vs. MP3 vs. WAV, Which is better? M4A: It is the MPEG 4 audio. It is newer than MP3 as the name suggests. M4A offers higher quality music with lower bitrates and file size. MP3: It is older, so it is almost compatible with every computer, music player and cell phone. WAV: The audio format is not compressed, so it's as full quality sound as possible. However, it has large file size. It can be 10 times bigger than MP3 or M4A file. It is often used for recording and editing audio.